I've been reading style blogs for a while now - especially within the petite blogging community. I figured I should give my own a shot. Expect me to start out slow - I don't have the best quality camera, and I currently do not have a ton of time to post. Consider this a work in progress. I've already been experimenting with lighting, so the next few pictures should be better quality than these. So, here goes nothing! I live in Miami, so its like 90 degrees out every day. However, the office I just started working in is FREEZING. Everyone in the office has a space heater under their desk! So, I figured despite sweating from the walk to and from my car, I should be warm while I am working. 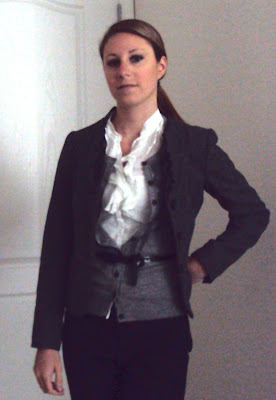 I attempted to layer a ruffled short sleeved button down from the BR factory, with a more detailed BR sweater over it, cinched at the waist by the belt, and then a blazer over it all. 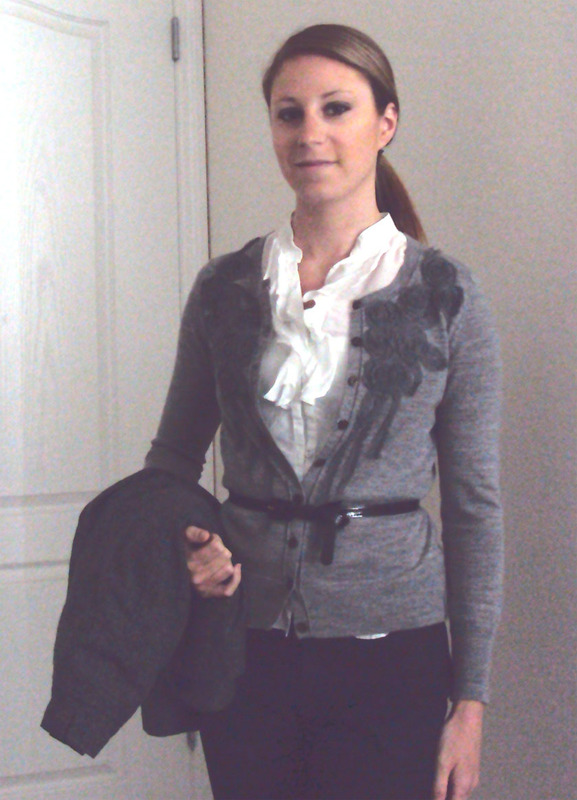 I really liked this look when I wore it to work that day, I felt really classy. I'm trying to brighten up my wardrobe - this day I failed. Everything is grey black or white. I also forgot to put on jewelry! As I said...a work in progress. I have to say, this BR silk shell is HUGE ON ME. The only reason I bought it in an XS regular sizing was because BR was having a buy 1 get 1 50% off sale online last year, and they had a sheath dress that I really wanted. I liked the pattern on this shirt so I figured I would give it a try. After purchasing the items, I got an email saying the sheath dress was out of stock! I made sure I was still getting the discount on the shirt, and I was, so not everything was lost. However, the shirt is so boxy and huge on me that I have to wear it tucked in all the time. It looks nice with a high waisted pencil skirt because it's kind of billowy, but I can never wear it untucked from anything. This semester I took a litigation skills course, so 3 times a week I had to wear a suit to class. I HATE being constricted by a suit and will avoid it by all costs. So, instead of wearing a suit all day, I tried to wear a blouse to class and would bring my suit in my car to change into later. 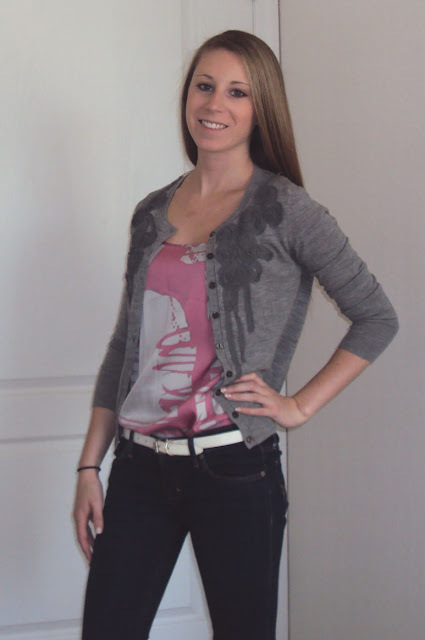 This outfit was originally supposed to be in a reverse day to night post. Most people show you how to go from the office to a night on the town - I, on the other hand, often have to go from street clothes to office attire at night. Nonetheless, the lighting was so bad at night that I didn't take a picture of me in nighttime suit attire. Imagine a dark grey skirt suit, this shirt tucked in, with the white belt around the skirt waist. It was pretty standard. Decent first blog post evarrrr, no? I look forward to this!